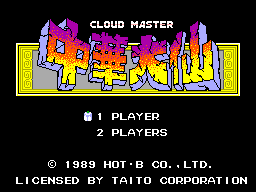 Cloud Master is my favourite game on the SEGA Master System, hands down. I was 9 when I first played this game, my friend who lived down the road had an old Master System Model One which he never played. He lent it to me, and the first game I tried was Cloud Master. I played the hell out of it, it was so addictive. IIn this game you play a boy who floats on a cloud who shoots balls out of his mouth (weird right?). You must travel through different worlds starting with Mt. Gogyo and destroy enemies with your lethal ball shooting. At the end of each level you must fight the boss of that level. 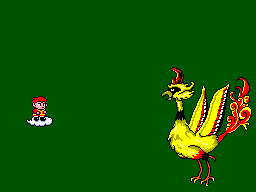 Once you beat the boss, you get rewarded with a special power which you can only use ONCE throughout the next level. You can also upgrade the balls you shoot, which is pretty cool. Each level is a challenge because this game is HARD! There is so much happening in one screen. 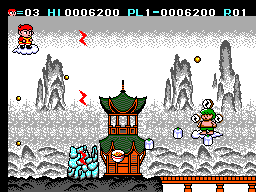 There are enemies down on the ground shooting stuff at you, there are flying enemies, Chinese maidens also shooting stuff at you and at the end, the boss is shooting lighting bolts at you! It's like ancient China went nuts! Graphics are amazing for an 8-bit console. They are simple, which gives the game a seperate charm. The main player is really well designed and the bosses look awesome, as you can see in the third picture. The backgrounds are lush with detail, which is what makes the game pleasing to the eye. Can't fault anything really. The music sounds authentic, its what you would expect from this game. The asian-oriental soundtrack really gives the game a good feel. Controls are spot on, quick, responsive controls which are handy especially when you're up to the harder boss levels, as the dodging and shooting is very quick. You will come back to this game no matter what! I'm still trying to beat this game after all these years, mainly because I want to see what all the levels look like. All in all, I simply love this game and when i picked this up to review it, it gave me a huge rush of nostalgia. Some others may agree that its way too hard. However for me, I always love a challenge.